Life is full of mysteries, chief among them is how LEGO elements manage to appear in the most unlikely places, once the amount of bricks you have overwhelms the initial tub you used for storage. When I put on a pair of new jeans I've never worn recently, I discovered a Racer X minifig (of Speed Racer fame) in the front right pocket. 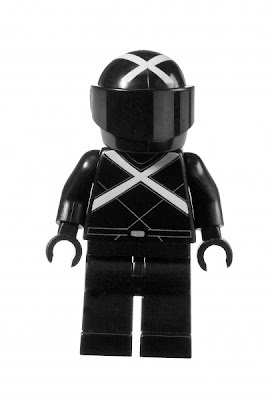 Now I remember getting the Racer X minifig at BrickCon 2008 in Seattle; however, that was well before I owned the jeans. As to how Racer X managed to work his way free of a Tupperware container in my office and inside that denim, that is a question for the LEGO Gods. I remain convinced that LEGO bricks are like pieces of sand after a day at the beach, they get into everything. Usually, there's an explanation. This time we'll just chalk it up to the same elves or pixies that help one finish a MOC (My Own Creation). Have you got LEGO Fever? How many frequent flier miles you got?